Yesterday was a weird day. Yes, I know...don't you dislike the word "weird"? It's so vague, and it's one of those words that people use for filling in the blanks of an awkward situation. Another one of those filler words is "random". Oh jeez, I can't believe that I'm actually talking about which words peeve me. Can you tell that I had a very long night? Let me at least touch upon one specific about yesterday: It was rainy and gray outside...and indoors it was stuffy and hot. These are some of the key ingredients for a stressful day. Did anyone else experience similar weather? Or can you at least recall a time when you have? It's such a bad combo...rainy, gray, stuffy, hot. And me and Aaron are both highly affected by weather, environment, and atmosphere. We are like walking mood rings, breathing thermometers, living weathervanes, dancing barometers. Anyway, you may have noticed that this Thursday's post has arrived much later in the day than usual. And as I was saying...my reason for the delay is because yesterday was a "weird" day...and the weirdness just totally threw me and Aaron off schedule...and so the photo editing, instruction writing, etc...didn't get done until today. 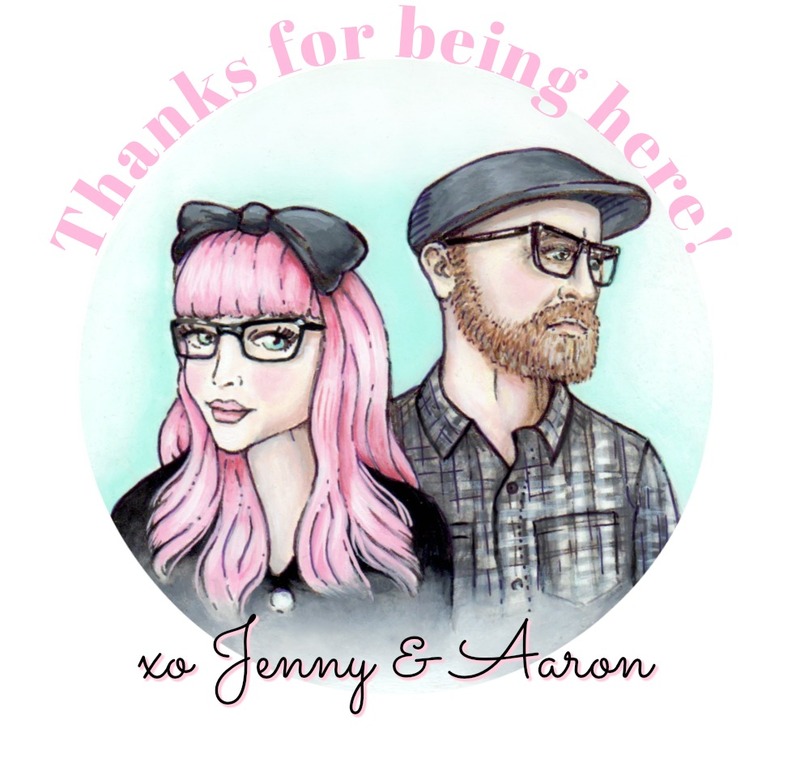 So we want to apologize big time to any of you who have come to rely upon the usual schedule of Art Journaling with Jenny & Aaron. We really did try our hardest to pull things together way into the wee hours last night (technically this morning)...but we simply couldn't. 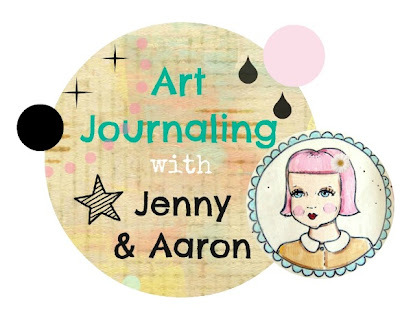 So, here's your slightly tardy Thursday Art Journaling with Jenny & Aaron. Last week we began our Fall themed journal and as promised, this week is a little follow up...the first spread in the book. And what better way to start than with our morning tea ritual? We love the shape of this book and it's just the right size for our purposes. It's slightly smaller, and that's a good thing since we're really only focusing on the small details of what Fall means to us. The two of us having tea in the morning...it's one of the things I look forward to most. It's our time for planning out the day. And often we'll be flipping through magazines or catalogs...either for creative inspiration (Anthropologie) or in Aaron's case...a little bit of brain stimulation to prep him for the day ahead (The New Yorker). We're so excited to see how your Theme Journals are coming along! Last week we did the cover, and this week shows the first layout inside. But next week we'll be putting the Fall Journal aside in order to switch back to our regularly scheduled programming. We've got something very cool in mind so be sure to check back! But this isn't the last you'll see of our Fall Journal...we'll continue to work on it and periodically I'll drop some pics into a blog post here and there. Ok, now it's time to shake the weirdness get creative. gesso pages. The pages in this circular journal are a bit thinner than we're used to working with. So we're taking steps to bolster them a bit. And the first step in doing this is gesso. We brushed a thick coat onto both pages and let them dry. trace page shapes. We'll also be bolstering both pages with a full sheet of patterned paper. So we first traced the shape of each page onto the patterned papers of our liking. cut papers. Cut out the papers and get them in position. adhere papers. To adhere, brush on a nice even coat of decoupage medium. 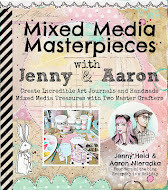 Jenny's favorite is matte gel medium by Golden but to adhere these we actually used Mod Podge. For larger areas such as this we find Mod Podge to be easier to work with. It's thinner and a bit wetter, and that makes it easier to brush on. After you've brushed on a nice coat, then just lay your paper down on the wet Mod Podge, press down, smooth out wrinkles and bubbles. when dry, seal. Let the pages dry fully. They are dry when they are no longer cool to the touch. When they dried we then sealed them matte gel medium by Golden. trim edges. If any excess paper remains you'll be able to see it well if you flip your pages over. Then simply trim them off. punch holes. We used a standard hole punch to punch through the binding holes that were already there. save "confetti". You know what they say: "One mans trash..." We often save our left overs from punching holes. These ones are especially good because they come from a patterned paper. We have a little ziplock that we store our confetti in. grab gesso & palette knife. The focal point of each page is the center so we want to apply a thick swatch of gesso as an undercoating to our photos etc..
apply gesso. We were going for a messy, piled up look so we applied a thick coat of gesso with a palette knife. This textured effect worked even better because we used gesso by Deco Art, which is super thick and heavy. let dry. While you let the gesso dry this is a good time to gather up some more elements that may have come to mind. Art Journaling is a process that is constantly in flux. mix paint for stamping. We wanted to mix up a Fall color. Leafy but not too bold. Orangey but not firey. Tan and red and some white gave us exactly the tone we were looking for. stamp both pages. Just brush your paint directly onto the stamp and then press down in the desired areas. We seem to never be looking for perfection. The sloppier, more scattered, the better. add color wash. We wanted to mute everything. Give it all a Fall glow. Just mix up a tint and then add water to your palette. apply to both pages. Then brush your wash onto the desired areas of your pages. blot & dab wash. Little by little brush the wash onto the desired areas of your pages and then blot and dab with a clean paper towel. This will give you a nice glow. speckle. Another trick that we always use. Just water down some paint, dip in your round detail brush, hold the brush about six inches above the page and simply tap the metal part of the brush, thus speckling the page with paint, the more sporadic the better. speckle some more. We seem to always go back and add yet another color of speckling...we're betting that you'll do the same. trace circles. 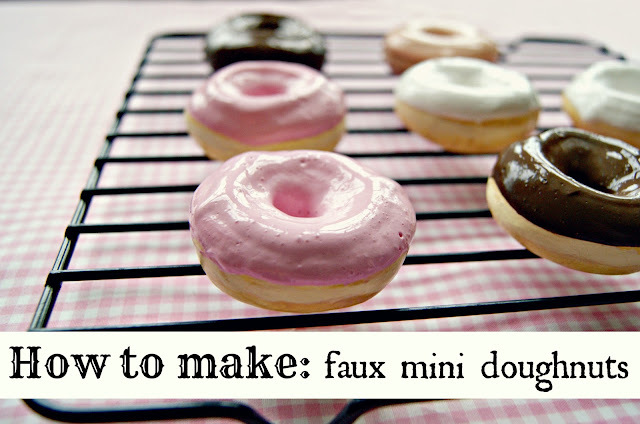 This is one of our go-to tricks. Well, it's not a trick...but it's a great way to add a big punch of color and shape to a page. Just trace circles of varying sizes. Use bottle caps, or jars, or cans. paint in circles. 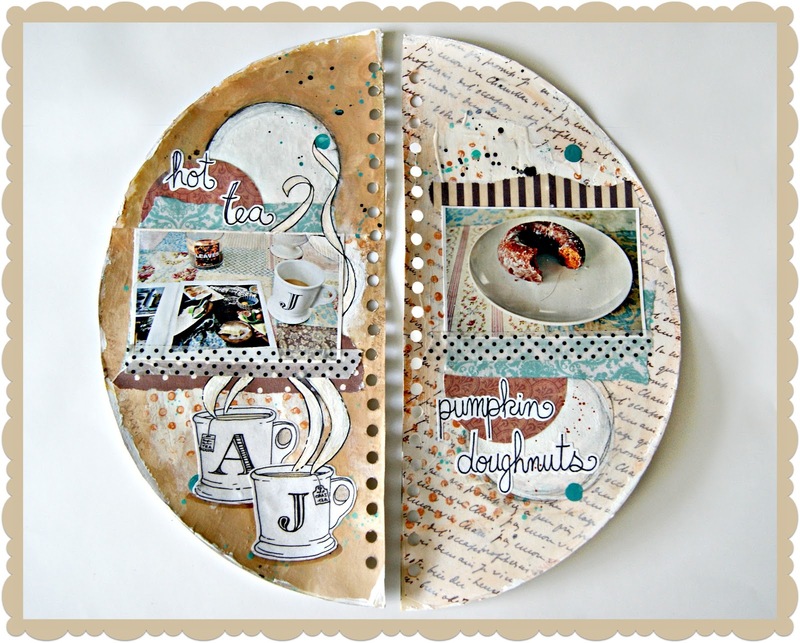 Using a 3/4 inch round brush paint in your circles. We went with white since our pages are all warm toned...we figured the white would be the bold punch we needed. outline circles with watercolor pencil. Watercolor pencils are just so easy...just scribble around an image lightly. "activate" pencil. Use your 3/4 inch brush...dip in water and then brush over your watercolor pencil lines, softening them and spreading the color out. This created a nice glow around the circles. add paint dots. Dip a gluestick into paint and dab about your pages. The less perfect the better. This is about little punches of color. Barely noticeable at a glance but if you were to take these dots of color away you'd surely notice that your pages lack something. do some doodling. We had a definite theme in mind...our morning tea. And we knew we were going to say the words "tea"...but we still needed a stand out image to drive the point home. We sketched out our two favorite monogrammed mugs on white paper and cut them out. play with layout. We had an idea of where all of our elements would go...but m,any things changed at the last minute. That's why playing around with all of your imagery and scraps and photos is good. adhere elements. Make your final decisions and then adhere them with decoupage medium. washi tape time! Another crutch of ours. We love washi tape! It's perfect for running along the binding of the book...a great page transition. And add bits in the corners of photos for a scrapbooky feel. add strips below photos. In this case we just needed a strip along the bottom of each photo. This was the one true bit of continuity between the pages. write some words. Yup...words...we needed words...even though we've got the imagery that does the talking...we just love lettering...well, it is a journal after all. We wrote them out with a sharpie on a piece of watercolor paper and cut the words out. adhere words. And then we decoupaged them to the pages. add some painted elements. We wanted some movement and curvy shapes. We hand painted some steam rising from our mugs. Whats great is that there are no rules to steam. Just freehand it. We kinda went with a ribbony effect. outline with sharpie pen. And to make our steam stand out against the multiple backgrounds it traverses we then outlined it with sharpie pen. In some spots we gave the steam a second coat of paint...and since we had already outlined it with the sharpie we made sure to use a fine brush so that we'd stay inside the lines. looking good! Even though these pages are fairly small, we think they contain a bunch. This is a fun look. feels good! Have you gotten your message across? Do you feel like you used the space well? Do you like your colors? Well, don't stop until all of your answers are YES. Hooray! Yup...week 9! how amazing is that?! And you've got your first spread completed in your theme journal. So fun! We simply cannot get over the fact that it's been 9 weeks of classes! And each week we're getting more and more heart warming emails from enthusiastic Art Journalers. The emails make us feel so good! In all of our work the one single thing that makes us happiest is hearing that we inspired someone to be creative...to make art...and to make art often. Some people tell us that since taking our classes they now have a brand new creative outlet...and that every time they feel stressed, etc...they'll reach for their Art Journal. We feel that there is no greater gift to give than the gift of Art. So...Please contact us and let us know your personal story. And please grab our button above to share on your blog or facebook...and be sure to leave a comment on this post and link up so that we can see your Art Journal! We've been blown away by the journals we've seen so far...can't wait to see more. After these 9 weeks we feel that we can definitely step things up a bit and expand our creative process...add some new tools to our box. We know that you guys are ready for the challenge! Thanks so much again for inspiring us! Fantastic designs. I wish I had the talent and imagination like that. It is really attractive to look at. I like rainy days...I live in a all year sunny town, so when rain comes it's a happy day! So I'll start with the weather. It's been so muggy, gray, and just plain gross on the shore. We have had everything closed up and the a/c going, but I went outside yesterday to do an outfit shoot and I wanted to die!!! I was wearing a dress that was more appropriate for warmer weather, along with tights. I sweating a lot and I even got 2 bug bites through my tights! The words "weird" and "random" can be very vague. That's simply why I have random in my blog's name, I didn't want to be tied to any subject. I understand your frustration with the words though, because when my kids use them, I immediately ask them to elaborate on the subject, it drives me crazy!....anyway, since our move I've found all our scrap booking goodies and I totally want to use a lot of the ideas you share! I love your journal series! And don't fret, the weather will be cooling down here shortly! Oh this one's a circle - how fun!!! Oh dear, you two - I already find it INCREDIBLE that you manage to find time not only to art journal each week but also to put it together as a lovely post like this. So really, no apologies for posting it later in the day! I have been so bad about finding time to journal. But very soon, I hope! We finally got the house all set up just in time for the housewarming party yesterday (which was a very good incentive to clean/unpack the house, finally). So I'm feeling a little better about things, though still crazy hectic busy... soon enough!! I miss my journal! I'm having so much fun with the theme journal. You guys always give me so may ideas. here are my pages from the past week.